Rori's first day! Jaime Ann: Rori's first day! 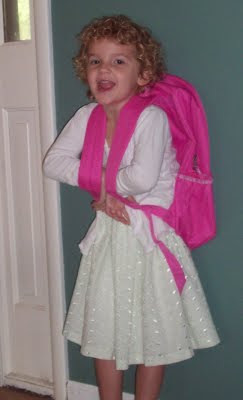 Today was Rori's first day of pre-school, and I had been trying not to think about it. I was worried because I didn't think she would know anyone and it is just the park district preschool, not a big fancy one. Rori is just so innocent and I worry about the influences that others might have over her, and the things she might pick up from being around other kids. I would love to keep her in her innocent bubble for as long as possible. Last night Rori wasn't able to sleep, I could tell she was very apprehensive. She told me she didn't want to go, she wanted to stay home with me. 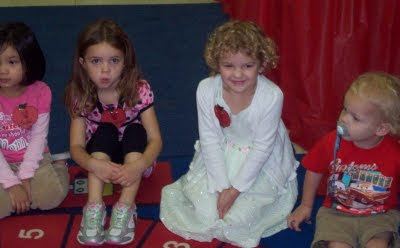 Before I went to bed last night I prayed over her that she would have a good day and meet some new friends. This morning, she seemed less nervous. I read her the book, "The Kissing Hand" which is about a little raccoon that goes to school for the first day and his mama kisses his hand and it stays with him all day. The book comes with little stickers to put on your child's hand. I kissed Rori's hand and put a sticker on it and told her that if she was lonely to look at her hand and remember my kiss was with her. 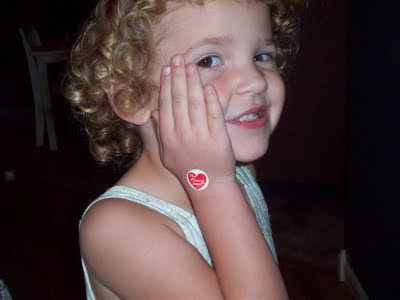 She then kissed my hand and gave me a sticker and said it was "in case I got lonely for her." Tears started to fall then--but I managed to hide them from her. We took pictures before school and she seemed excited. Papa left for work late so that he could come with to bring her to school. When we got there, we found her cubby for her backpack and she spotted a friend! She said, "Mommy, that girl went to Cubbies and Vacation Bible school!" I was so relieved and was thanking God for that. I brought her over to the little girl and asked if she remembered Rori, and she said she did. Then we kissed Rori goodbye. Liam took it the worst :) He wanted to stay and play with her. He even joined the circle of kids. Yeah! Sounds like it was a hit...:) So glad it went well. I got a kissing hand today and I wanted to cry too. She kissed my hand and put it on for me. I love her and can't believe she is 4 already. Baby Liam has been such a joy too. Love MOM PS How will the new Baby break our hearts?